From left: Andy Key, Kelvin Lowes and Nick Brown at the European Masters Championships. Several locally-based distance runners were in the medals at the European Masters Championships in Spain last weekend. Carol and Kelvin Lowes (Hastings Athletic Club), Andy Key (Hastings AC), and Helen and Nick Brown (Hastings Runners) successfully competed for Great Britain in these non-track championships in Alicante. The Great Britain F40 relay team including Helen Brown (centre) and Carol Lowes (right). The quintet ran a 10km road race in blisteringly hot conditions last Friday evening and were led home by Key in a personal best time of 44 minutes, 48 seconds. Carol Lowes was in the bronze medal-winning GB FV40 team and her husband Kelvin’s M40 team finished fourth. All except Key were in action again on Saturday morning, taking part in a deceptively tough cross-country relay over a twisting 2km course which featured a variety of surfaces and a fair number of trip hazards. 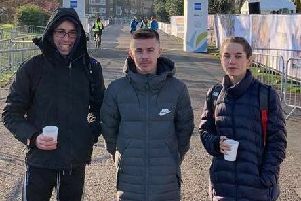 Carol Lowes and Helen Brown were in the FV40 team which won a bronze medal, Hastings Runners coach Nick Brown ran the opening leg for the bronze medal-winning MV60 team and Kelvin Lowes also picked up a bronze medal in the MV40 team, who each ran 4km. Great Britain were up against a strong field of other nations from around the continent, including Switzerland, Spain, France, Portugal, Germany, Italy and Romania to name a few.